A slice of Life anime that is actually a slice of life. The characters are light and fun. The premise is not deep, but it is entertaining. The art is absolutely stunning. If you want a pallet cleanser, or something to just cool off with, watch this anime. Seriously do not take it seriously. Go in with expectations of light yuri, growing emotions, and a desire to see the world from under the water, and you will not be disappointed. Oh... and THE ART. Seriously DAMN. If you liked Aria - this is done by the same person. Light Fluffy and Pretty. The only three words you need to know. First point to note: no cringe-worthy fan service, in fact barely any! Amazing! The basis of this anime is that it follows the main character Teko as she learns how to scuba-dive. But this anime offers so much more than that. For one, there isn't a whole lot of scuba-diving - which might sound bad but considering we're following an absolute beginner, it's realistic. Teko takes us through her inner journey of feeling lost, afraid, and anxious as she learns about the hobby and all the dangers and safety regulations she has to follow. Alongside this, Teko is experiencing a feeling of limbo, estranged from what she was comfortable with before she moved. As such, her growth is steady and constant, and she receives a lot of support from her club and especially her new friend Pikari. This anime offers a lot of advice and assurance to those who feel they're stuck in one place or feeling anxious - I had a feeling like that a couple weeks, but this anime reminds you that it's absolutely fine to go at your own pace, something I think everyone needs to constantly hear. 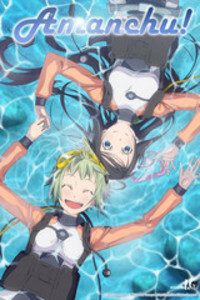 Amanchu's music and animation are also quite well done, and the parameters of scuba-diving are quite well-researched and explained well for those of us who, like Teko, have no experience whatsoever about diving. This anime will leave you feeling good at the end, of that I can guarantee. I have always loved the beach. When I was younger my grandmother would tell me I was part dolphin. Some of my fondest memory can be found spending my summers at the ocean so it's not surprised that this is the anime for me. Amanchu! is a Slice of Life anime about two girls, one a girl full of life who has been living near the ocean. The other who has been afraid of living and how this new girl brings joy to her through Suba Diving. If you like the sea, a nice anime like The Flying Witch, then you will most definitely love this tale. Learning how to dive into your emotions..
Misleading title. I'm not really sure if Amanchu! really does that or not. But there is an overarching theme going on of the protagonist trying to learn how to live with herself and actually do the things she wants to do instead of keeping up with public appearance. The green haired chick on the cover for this show has some rather impressive doofy faces that make for some interesting comedic moments. The show itself is really relaxed, there's no sense of urgency provided from the story, it's a 100% slice of life show. The quiet demeanor of the protagonist carries over with the theme of the show, which makes this a great watch when you're trying to unwind from a rather busy day. I would honestly take the time to watch this over if I could. It has a great plot, the animation is up to par and the character lay out is extremely impressive for what this anime is. I would recommend it to any new anime watchers and hope to see more. About the title: if you haven't seen Aria, you probably should. It is now old enough to be considered a classic; one of the greats of iyashikei storytelling. But this review isn't about Aria, it's about Amanchu! and while it bears similarities in many things from the relaxing theme to the old-fashioned deformed faces and bizarrely-shaped (but adorable) cats, the show is very much its own thing. It touches on themes of courage and friendship while showcasing the main character's budding relationship with a new friend over a passion for scuba diving and everything that leads to. It's a heartwarming tale, told with some of Production IG's most beautiful visuals and music, and very easy to get hooked on. Highly recommended. This is a Yuri anime that is not really about scuba diving. All of the Yuri is implied...mostly. There is a point in the show where one would have to be an idiot or in denial not to see it, and I'm talking about the last shot in the OPENING CREDITS. Sure, the show could be interpreted as not being Yuri if the viewer is really homophobic or an idiot, but this is even gayer then Gundam Wing. This is not really a show about scuba diving, in as much as it is a show about two girls falling in love while one trains the other to become a scuba diver. Most of the show is on land, and the main character does not actually go scuba diving until the last episode. It's by the same woman as ARIA, so expect slice of life, water, and amazingly sappy dialogue. It's also - As I mentioned before - hilariously full of Yuri undertones. It gets to the point where it shifts the focus of the episode at one point. Lack of scuba diving and presence of lesbians aside, the show is sweet, full of heart, and has a very nice ending that both gives a sense of closure, and sets the stage for future events. I give it full marks. Amanchu, the high tide of SoL! We need more anime like this! So I watch plenty of anime, as most people on this site do. Amanchu is definitely in my Top 15 if not Top 10 at the minimum. It's a slice of life that's actually a slice of life. Sometimes the anime will drift from diving, but it focuses on the personal development of the characters (especially Teko) and that's something I always like seeing. It has fun comedy, light hearted feels, amazing music, and not to mention AMAZING ART! Same person that did Aria if I remember correctly. So obviously amazing! Straight to the point: Even with well above average water effects, nice looking characters, and very good music and backgrounds, the over-used "Raggedy Annie" face animation detracts an entire star from this show. Was it a running gag that didn't translate well, or, lazy animation? With female characters I actually like, and that look pretty realistic, that goofy face just kills it. BTW what's with mermaid dresses and lumber jack boots? Most healing type anime (the recent Flying Witch for example) have very relaxed characters and pacing, Amanchu, well, not so much. That's not to say it's paced very fast, it isn't, but of the two lead characters one is a massive ball of energy that explodes about once a minute so it certainly feels faster paced than it is. Futaba (Teko from now on) is a girl who just moved to a sea-side town and is all too clearly a shy girl who feels torn away from evertything she knew meets Hikari (or by her nickname Pikari) a super energetic, supre exitable girl. They are polar opposites, which is perhaps why they attract each other and get along so well (there is some light yuri subtext hinted at). I said the show feels fast paced but that doesn't detract or take away from the level of detail that is hidden in each little thing. Pikari for example is a mixture of Hikari (or light) and Pika which means bomb and pikapika which is glitter and sparkle and that name so embodies everything about her. Even her family name, Kohinata (which means small sunlit place) is telling us about her. The same is true for Teko, her name Futaba means sprout or bud, which just shows how much she can grow from here on as a character. Her last name is also fitting, she is very tall and it means big tree. Besides that the animation is really excellent and personally I like the emotiocon faces that the characters pull off, though I can certainly understand why some would be put off by them (certainly considering how often they are used). 3 episodes in we have only met the two leads and a single teacher who is obviously going to be plot relevant, as she is the diving club advisor. There is also a creature called Cha who is supposedly a cat, though he looks like no cat I've ever seen.